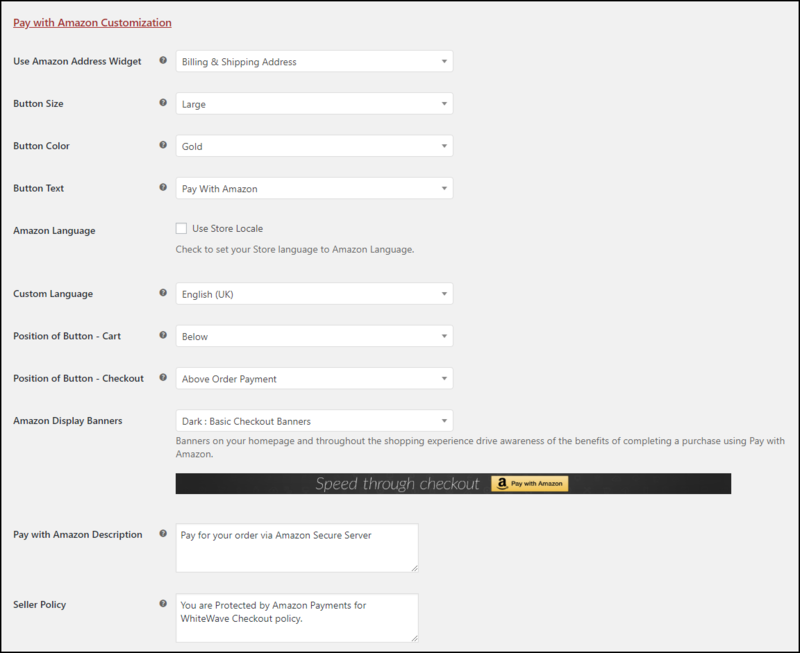 Dashboard > Plugins > Installed Plugins > ELEX Amazon Payment Gateway for WooCommerce > Settings. Check the Amazon Payment Gateway setting to enable the plugin. 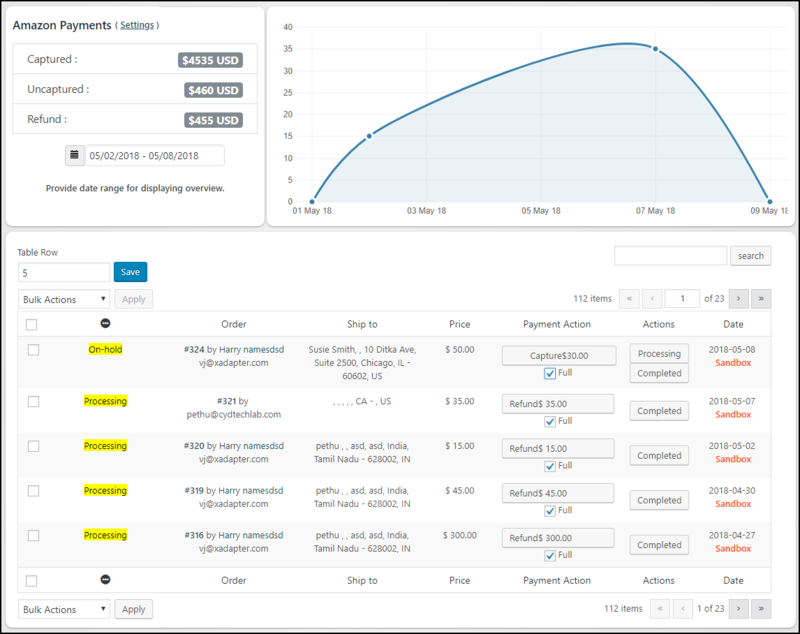 Also, to view all the transactions occurred using Amazon Payments, enable Amazon Payment Overview. In addition to this, there are few generic settings. You can read the General Settings section of the setting up documentation. Firstly, signup for an Amazon Pay account. Once the registration is successful, you’ll obtain Amazon Payment credentials. Select either Sandbox Mode(recommended for testing) or Live Mode, based on your preference. Enter Merchant Id, Access Keys, Secret Keys, Amazon Client ID and respective Amazon Client Secret. For more detailed information, you can refer the Amazon Payment Credentials section of the setting up documentation. You can choose to enable a custom Amazon pay button on the Cart page as well as Checkout page. Additionally, you can choose to Capture the payments as soon as the order is placed or let shop owners Authorize the charges. For more detailed information, you can refer the Pay with Amazon Abilities section of the setting up documentation. The plugin provides lots of handy customizations in terms of using Amazon Address Widget, Amazon pay button size, color, & text, language settings, the position of the button, display banners and so on. For more detailed information, you can refer the Pay with Amazon Customization section of the setting up documentation. You can notice the Amazon Payments banner on top of the Cart page. 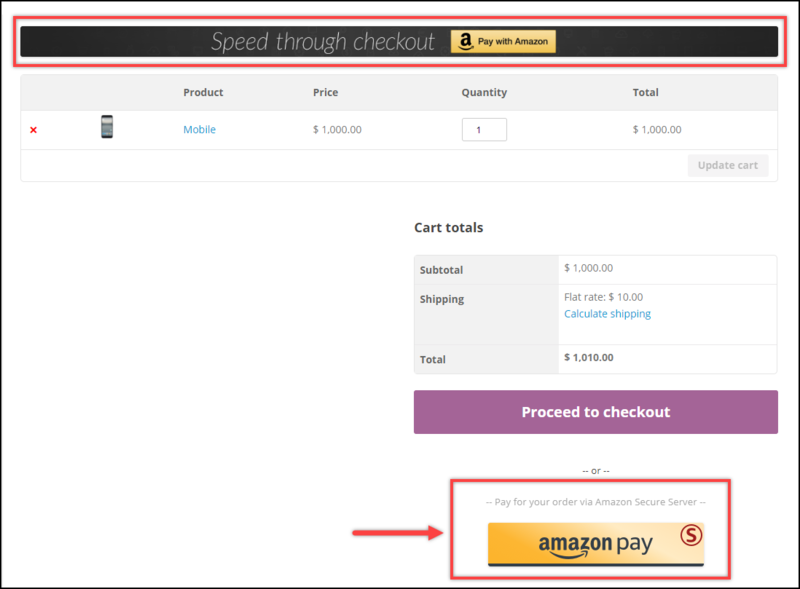 A user can checkout from the cart page by clicking on the Amazon Pay button placed on the cart, as shown in the screenshot on the left. 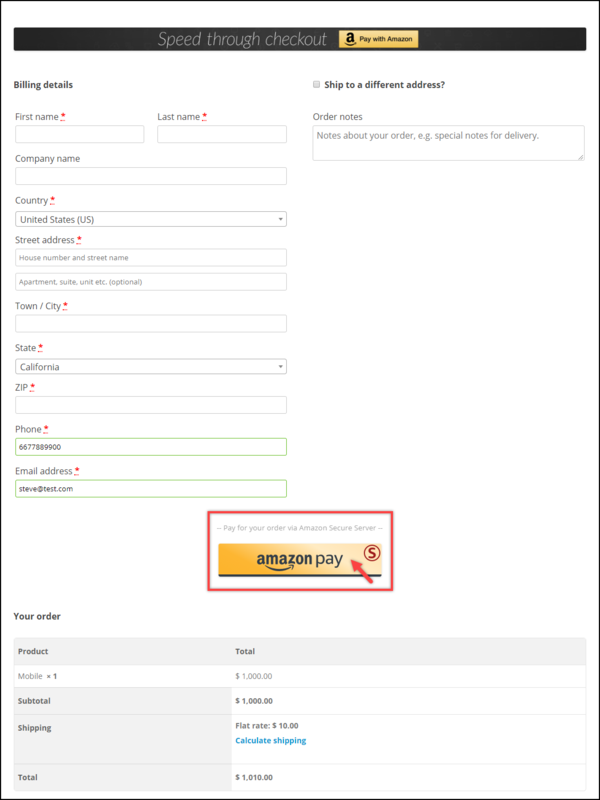 On the Checkout page, click on Amazon Pay button to proceed with the order transaction. A new window will open, in which you need to enter your Amazon login credentials. Once you have logged in successfully into your Amazon account, the API automatically fetches the shipping address from your Amazon account and displays in a widget. It also shows payment methods available to you. Finally, select the desired address and payment method, and click on Place Order button to complete the transaction. Once the order is placed, head to Amazon Payments Overview page. In this page, you can view all your transactions, initiate refunds and capture payments. 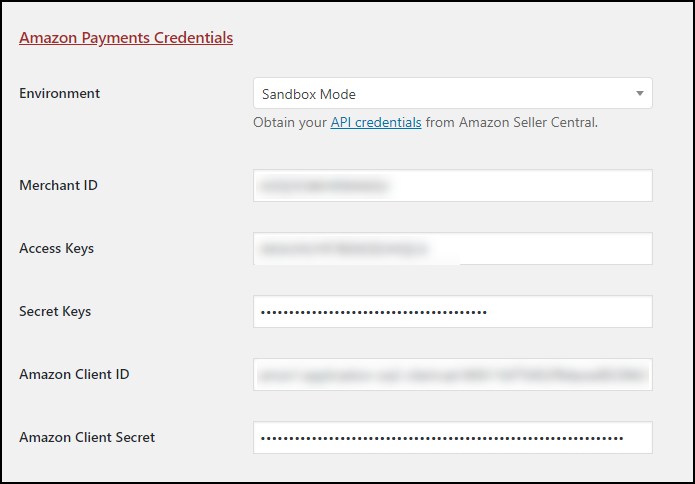 To complete the payment, You can use this Amazon Pay Sandbox account credentials ( User: pethu@cydtechlab.com | Pass: 123456789 ).